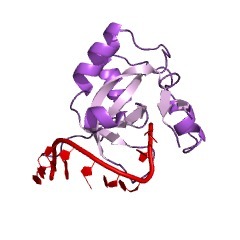 The domain within your query sequence starts at position 236 and ends at position 371; the E-value for the PAZ domain shown below is 4.18e-4. 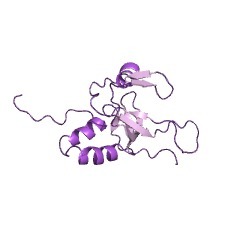 This domain is named PAZ after the proteins Piwi Argonaut and Zwille. 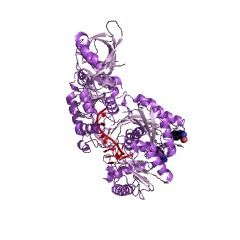 This domain is found in two families of proteins that are involved in post-transcriptional gene silencing. These are the Piwi family and the Dicer family, that includes the Carpel factory protein. The function of the domains is unknown but has been suggested to mediate complex formation between proteins of the Piwi and Dicer families by hetero-dimerisation. The three-dimensional structure of this domain has been solved. 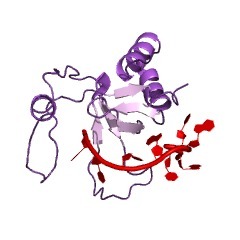 The PAZ domain is composed of two subdomains. One subdomain is similar to the OB fold, albeit with a different topology. The OB-fold is well known as a single-stranded nucleic acid binding fold. The second subdomain is composed of a beta-hairpin followed by an alpha-helix. 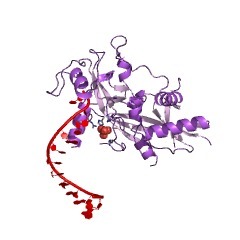 The PAZ domains shows low-affinity nucleic acid binding and appears to interact with the 3' ends of single-stranded regions of RNA in the cleft between the two subdomains. 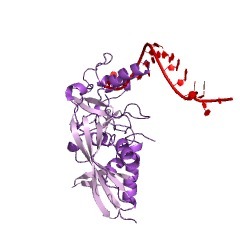 PAZ can bind the characteristic two-base 3' overhangs of siRNAs, indicating that although PAZ may not be a primary nucleic acid binding site in Dicer or RISC, it may contribute to the specific and productive incorporation of siRNAs and miRNAs into the RNAi pathway. This domain is named after the proteins Piwi Argonaut and Zwille. 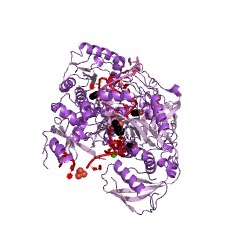 It is also found in the CAF protein from Arabidopsis thaliana. 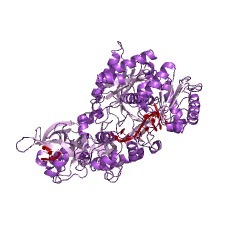 The function of the domain is unknown but has been found in the middle region of a number of members of the Argonaute protein family, which also contain the Piwi domain (IPR003165) in their C-terminal region [(PUBMED:12906857)]. 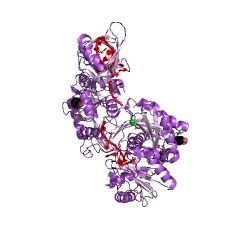 Several members of this family have been implicated in the development and maintenance of stem cells through the RNA-mediated gene-quelling mechanisms associated with the protein DICER. 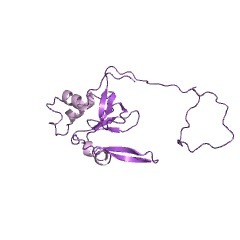 There are 8514 PAZ domains in 8477 proteins in SMART's nrdb database. Taxonomic distribution of proteins containing PAZ domain. This tree includes only several representative species. The complete taxonomic breakdown of all proteins with PAZ domain is also avaliable. Click on the protein counts, or double click on taxonomic names to display all proteins containing PAZ domain in the selected taxonomic class. 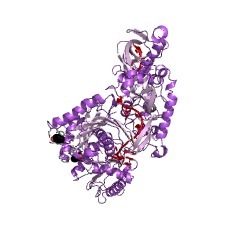 Structure and nucleic-acid binding of the Drosophila Argonaute 2 PAZdomain. 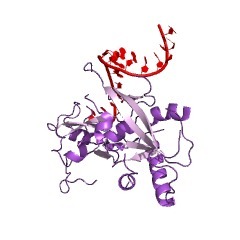 RNA interference is a conserved mechanism that regulates gene expressionin response to the presence of double-stranded (ds)RNAs. 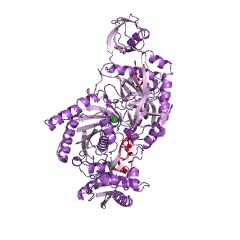 The RNaseIII-like enzyme Dicer first cleaves dsRNA into 21-23-nucleotide smallinterfering RNAs (siRNAs). In the effector step, the multimericRNA-induced silencing complex (RISC) identifies messenger RNAs homologousto the siRNAs and promotes their degradation. 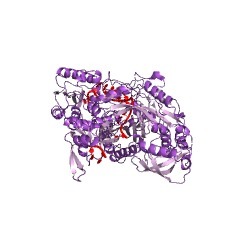 The Argonaute 2 protein(Ago2) is a critical component of RISC. 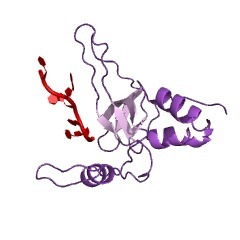 Both Argonaute and Dicer familyproteins contain a common PAZ domain whose function is unknown. 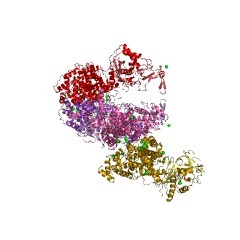 Here wepresent the three-dimensional nuclear magnetic resonance structure of theDrosophila melanogaster Ago2 PAZ domain. This domain adopts anucleic-acid-binding fold that is stabilized by conserved hydrophobicresidues. The nucleic-acid-binding patch is located in a cleft between thesurface of a central beta-barrel and a conserved module comprising strandsbeta3, beta4 and helix alpha3. Because critical structural residues andthe binding surface are conserved, we suggest that PAZ domains in allmembers of the Argonaute and Dicer families adopt a similar fold withnucleic-acid binding function, and that this plays an important part ingene silencing. 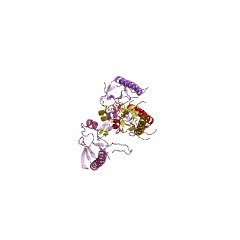 The crystal structure of the Argonaute2 PAZ domain reveals an RNA bindingmotif in RNAi effector complexes. RISC, the RNA-induced silencing complex, uses short interfering RNAs(siRNAs) or micro RNAs (miRNAs) to select its targets in asequence-dependent manner. 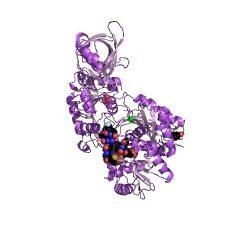 Key RISC components are Argonaute proteins,which contain two characteristic domains, PAZ and PIWI. PAZ is highlyconserved and is found only in Argonaute proteins and Dicer. We havesolved the crystal structure of the PAZ domain of Drosophila Argonaute2.The PAZ domain contains a variant of the OB fold, a module that oftenbinds single-stranded nucleic acids. 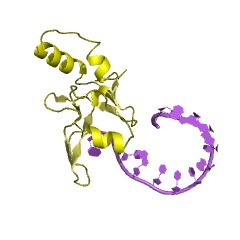 PAZ domains show low-affinity nucleicacid binding, probably interacting with the 3' ends of single-strandedregions of RNA. 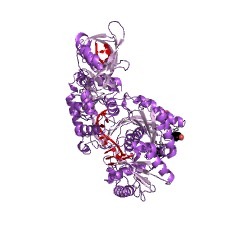 PAZ can bind the characteristic two-base 3' overhangs ofsiRNAs, indicating that although PAZ may not be a primary nucleic acidbinding site in Dicer or RISC, it may contribute to the specific andproductive incorporation of siRNAs and miRNAs into the RNAi pathway. 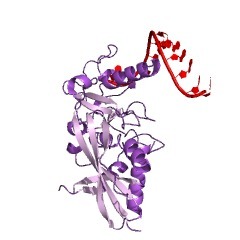 Structure and conserved RNA binding of the PAZ domain. 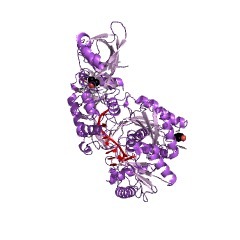 The discovery of RNA-mediated gene-silencing pathways, including RNAinterference, highlights a fundamental role of short RNAs in eukaryoticgene regulation and antiviral defence. 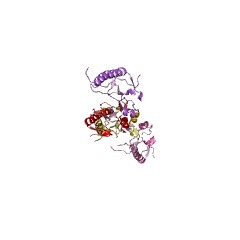 Members of the Dicer and Argonauteprotein families are essential components of these RNA-silencing pathways.Notably, these two families possess an evolutionarily conserved PAZ(Piwi/Argonaute/Zwille) domain whose biochemical function is unknown. 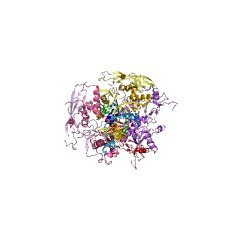 Herewe report the nuclear magnetic resonance solution structure of the PAZdomain from Drosophila melanogaster Argonaute 1 (Ago1). 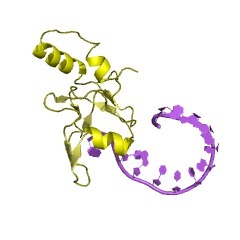 The structureconsists of a left-handed, six-stranded beta-barrel capped at one end bytwo alpha-helices and wrapped on one side by a distinctive appendage,which comprises a long beta-hairpin and a short alpha-helix. 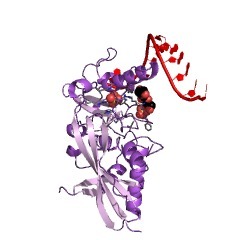 Usingstructural and biochemical analyses, we demonstrate that the PAZ domainbinds a 5-nucleotide RNA with 1:1 stoichiometry. 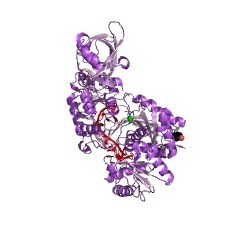 We map the RNA-bindingsurface to the open face of the beta-barrel, which contains amino acidsconserved within the PAZ domain family, and we define the 5'-to-3'orientation of single-stranded RNA bound within that site. Furthermore, weshow that PAZ domains from different human Argonaute proteins also bindRNA, establishing a conserved function for this domain.